Noise-induced hearing loss is almost always preventable if properly fitted hearing protectors are worn to reduce exposure. Many individuals choose not to wear hearing protection because it may interfere with effective communication in the workplace or it may be uncomfortable. Hearing protector comfort has not received the same amount of attention as noise reduction capability. The present study was conducted to evaluate the comfort level of two different types of insert earplugs as well as the attenuation levels achieved by the earplugs. Attenuation levels were obtained with a commercially available earplug fit-test system, and the comfort ratings were obtained by questionnaire. The primary research objective was to determine whether hearing protector comfort was related to measured attenuation values. A linear mixed effects model provided evidence for an inverse relationship between comfort and attenuation. A major barrier to effective wear of hearing protection is comfort. 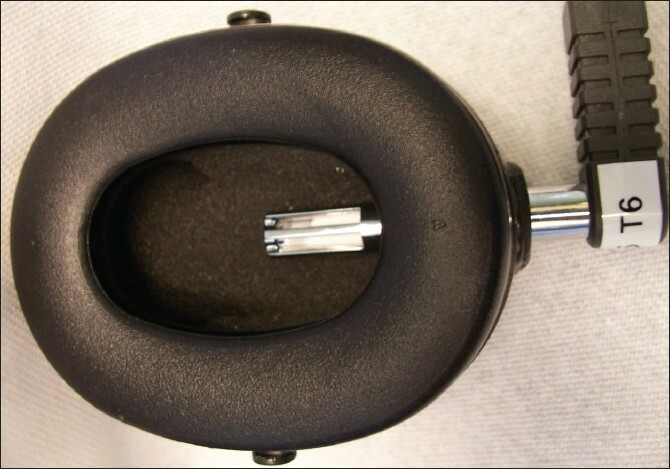 This study examined several comfort indicators in the earmuff-type hearing protectors. Twenty subjects wore hearing protectors instrumented with two different temperature/humidity measurement systems (Omega and iButton) while walking a corridor for about 25 min. The instruments recorded the temperature and humidity every 10 s and their results were compared. In addition, skin surface pH was measured at the ear canal entrance before and after the task. Finally, the subject indicated earmuff comfort at the beginning and end of the session. Earmuff comfort decreased significantly over the course of the walking task. 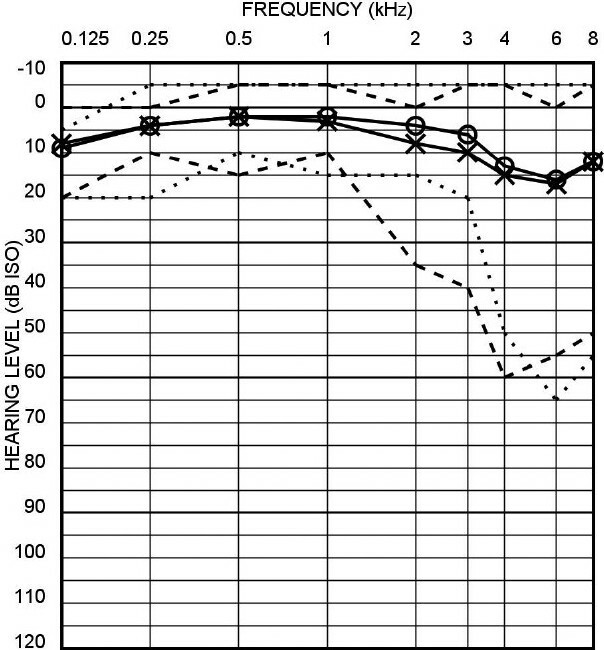 Ear canal pH became slightly less acidic, but the change was not statistically significant. The two temperature/humidity systems provided comparable results. Heat increased at about 0.3°F while humidity built up at about 0.5%/min. However, the study found some limitations on the instrumentation. The complexity of the electrical connections and equipment in the Omega probe system led to loss of three subject's data. The iButton device was more robust, but provided only 256 gradations of temperature and relative humidity. Even with its limitations, the iButton device would be a valuable tool for field studies. The present study showed that the buildup of heat and humidity can be modeled using linear equations. The present study demonstrates that relatively inexpensive tools and a low-exertion task can provide important information about the under-earmuff environment, which can inform assumptions about comfort during use. A human factors experiment employed a hemi-anechoic sound field in which listeners were required to localize a vehicular backup alarm warning signal (both a standard and a frequency-augmented alarm) in 360-degrees azimuth in pink noise of 60 dBA and 90 dBA. Measures of localization performance included: (1) percentage correct localization, (2) percentage of right--left localization errors, (3) percentage of front-rear localization errors, and (4) localization absolute deviation in degrees from the alarm's actual location. 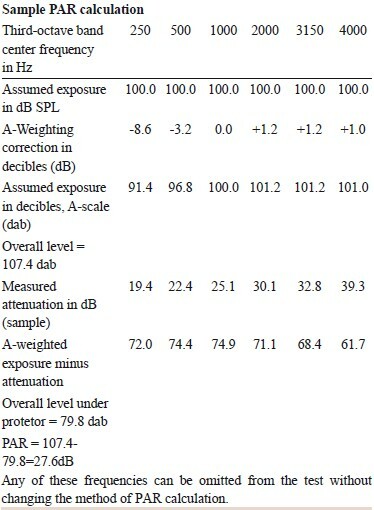 In summary, the data demonstrated that, with some exceptions, normal hearing listeners' ability to localize the backup alarm in 360-degrees azimuth did not improve when wearing augmented hearing protectors (including dichotic sound transmission earmuffs, flat attenuation earplugs, and level-dependent earplugs) as compared to when wearing conventional passive earmuffs or earplugs of the foam or flanged types. Exceptions were that in the 90 dBA pink noise, the flat attenuation earplug yielded significantly better accuracy than the polyurethane foam earplug and both the dichotic and the custom-made diotic electronic sound transmission earmuffs. However, the flat attenuation earplug showed no benefit over the standard pre-molded earplug, the arc earplug, and the passive earmuff. 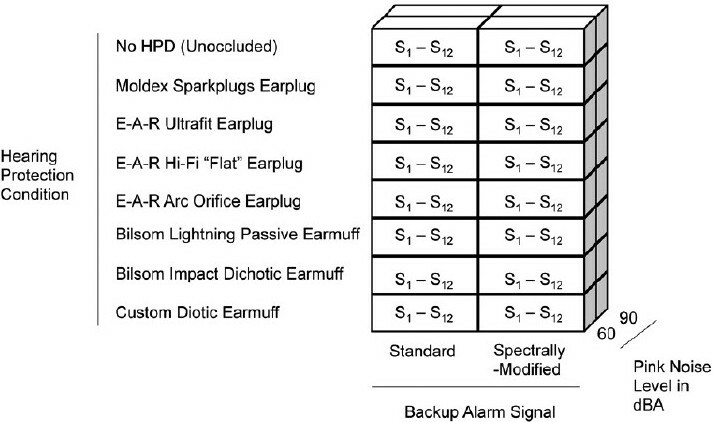 Confusions of front-rear alarm directions were most significant in the 90 dBA noise condition, wherein two types of triple-flanged earplugs exhibited significantly fewer front-rear confusions than either of the electronic muffs. On all measures, the diotic sound transmission earmuff resulted in the poorest localization of any of the protectors due to the fact that its single-microphone design did not enable interaural cues to be heard. Localization was consistently more degraded in the 90 dBA pink noise as compared with the relatively quiet condition of the 60 dBA pink noise. A frequency-augmented backup alarm, which incorporated 400 Hz and 4000 Hz components to exploit the benefits of interaural phase and intensity cues respectively, slightly but significantly improved localization compared with the standard, more narrow-bandwidth backup alarm, and these results have implications for the updating of backup alarm standards. In phase 1 of a large multiyear effort, health communication and health promotion models were used to develop a comprehensive hearing loss prevention training program for carpenters. Additionally, a survey was designed to be used as an evaluation instrument. The models informed an iterative research process in which the authors used key informant interviews, focus groups, and early versions of the survey tool to identify critical issues expected to be relevant to the success of the hearing loss prevention training. Commonly held attitudes and beliefs associated with occupational noise exposure and hearing losses, as well as issues associated with the use or non-use of hearing protectors, were identified. The training program was then specifically constructed to positively shape attitudes, beliefs, and behavioral intentions associated with healthy hearing behaviors - especially those associated with appropriate hearing protector use. The goal was to directly address the key issues and overcome the barriers identified during the formative research phase. The survey was finalized using factor analysis methods and repeated pilot testing. It was designed to be used with the training as an evaluation tool and thus could indicate changes over time in attitudes, beliefs, and behavioral intentions regarding hearing loss prevention. Finally, the training program was fine tuned with industry participation so that its delivery would integrate seamlessly into the existing health and safety training provided to apprentice carpenters. In phase 2, reported elsewhere in this volume, the training program and the survey were tested through a demonstration project at two sites. Two demonstration projects were conducted to evaluate the effectiveness of a comprehensive training program for carpenters. This training was paired with audiometry and counseling and a survey of attitudes and beliefs in hearing loss prevention. All participants received hearing tests, multimedia instruction on occupational noise exposure/hearing loss, and instruction and practice in using a diverse selection of hearing protection devices (HPDs). A total of 103 apprentice carpenters participated in the Year 1 training, were given a large supply of these HPDs, and instructions on how to get additional free supplies if they ran out during the 1-year interval between initial and follow-up training. Forty-two participants responded to the survey a second time a year later and completed the Year 2 training. Significant test-retest differences were found between the pre-training and the post-training survey scores. Both forms of instruction (individual versus group) produced equivalent outcomes. The results indicated that training was able to bring all apprentice participants up to the same desired level with regard to attitudes, beliefs, and behavioral intentions to use hearing protection properly. It was concluded that the health communication models used to develop the educational and training materials for this effort were extremely effective. The effect of training instruction, whether presented as the manufacturer's printed instructions, a short video training session specific to the product, or as a one-on-one training session was evaluated using four hearing protection devices with eight groups of subjects. Naïve subjects were recruited and tested using three different forms of training: written, video, and individual training. The group averages for A-weighted attenuation were not statistically significant when compared between the video or the written instruction conditions, regardless of presentation order. The experimenter-trained A-weighted attenuations were significantly greater than the written and video instruction for most of the protectors and groups. For each earplug, the noise reduction statistic for A-weighting (NRS A ) and the associated confidence intervals were calculated for the 80 th and 20 th percentiles of protection. Across subject groups for each protector, the differences between NRS A ratings were found to be not statistically significant. Several comparisons evaluating the order of testing, the type of testing, and statistical tests of the performance across the groups are presented. Noise-induced hearing loss (NIHL) is a common and preventable injury for farmers. Farmers are frequently exposed to excessive noise, ranking among the top three occupations and industries with the highest risk for hearing loss. Use of hearing protection among farmers is not common. Although the age when NIHL begins among farmers is unknown, its prevalence is higher among male adolescents who live and work on farms. The purpose of this paper is to describe how NIOSH created partnerships to promote hearing conservation for this hard-to-reach population. Partnerships included organizations and individuals who were trusted sources of information for the target population, young farmers 14-35 years of age and their families, and those who had linkages in rural communities. NIOSH engaged partners through exhibits and train-the-trainer workshops at state or national conventions. NIOSH workshops included basic information on NIHL as well as information on free or low-lost resources that participants could use in training others at schools and community events. People with hearing conservation expertise have an important role and many opportunities to improve the knowledge and implementation of hearing conservation among those in agriculture. The performance of hearing protection devices (HPD) worn by individual workers in specific noise-exposure environments has been difficult to assess using the hearing protector ratings printed on HPD packages. Because the role of the HPD in prevention of hearing loss remains as a vital last line of defense against the effects of noise exposure, proper assessment of their performance is increasingly critical. HPD fit-testing procedures now allow the individual fit-testing of HPD to assist in appropriate selection of HPD for individual workers, to aid in training workers on proper use of HPDs, and a range of other applications. Understanding these technologies, their strengths and weaknesses, and appropriate application of the results of fit-testing may enable employers to make improvements in their hearing loss prevention program performance. Individual fit-testing of earplugs is an exciting new trend in hearing conservation. 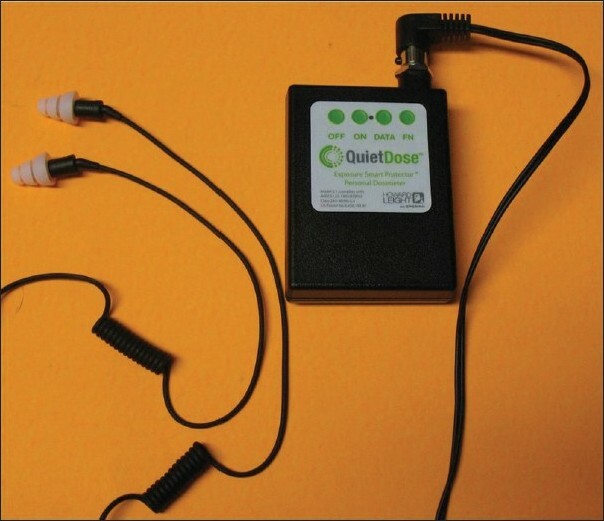 This article reviews how this technology is being used to protect noise-exposed workers. Earplug fit-testing systems are becoming more commercially available and more feasible for field use. Individual fit-testing is no longer used only for research investigations but is being incorporated in Hearing Conservation Programs (HCP) to improve training, document protection and evaluate the effectiveness of the hearing protector element of an effective HCP. 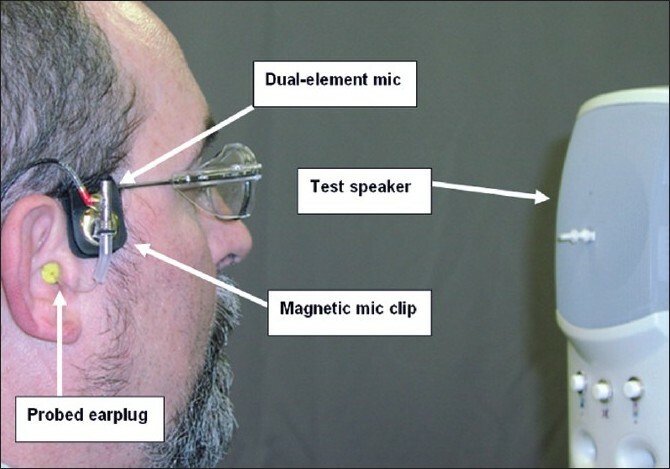 Numerous studies have shown that the reliability of using laboratory measurements to predict individual or even group hearing protector attenuation for occupationally exposed workers is quite poor. This makes it difficult to properly assign hearing protectors when one wishes to closely match attenuation to actual exposure. An alternative is the use of field-measurement methods, a number of which have been proposed and are beginning to be implemented. We examine one of those methods, namely the field microphone-in-real-ear (F-MIRE) approach in which a dual-element microphone probe is used to measure noise reduction by quickly sampling the difference in noise levels outside and under an earplug, with appropriate adjustments to predict real-ear attenuation at threshold (REAT). We report on experiments that validate the ability of one commercially available F-MIRE device to predict the REAT of an earplug fitted identically for two tests. Results are reported on a representative roll-down foam earplug, stemmed-style pod plug, and pre-molded earplug, demonstrating that the 95% confidence level of the Personal Attenuation Rating (PAR) as a function of the number of fits varies from ±4.4 dB to ±6.3 dB, depending on the plug type, which can be reduced to ±3.1 dB to ±4.5 dB with a single repeat measurement. The added measurement improves precision substantially. However, the largest portion of the error is due to the user's fitting variability and not the uncertainty of the measurement system. Further we evaluated the inherent uncertainty of F-MIRE vs. the putative "gold standard" REAT procedures finding, that F-MIRE measurement uncertainty is less than one-half that of REAT at most test frequencies. An American National Standards Institute (ANSI) working group (S12/WG11) is currently involved in developing methods similar to those in this paper so that procedures for evaluating and reporting uncertainty on all types of field attenuation measurement systems can be standardized. We conclude that the hearing conservationist now has available a portable, convenient, quick, and easy-to-use system that can improve training and motivation of employees, assign hearing protection devices based on noise exposures, and address other management and compliance issues. Despite a high level of sound exposure and a fairly large selection of earplugs available, musicians have often been reported to use personal hearing protectors only seldom. For better hearing conservation, it is important to identify and eliminate the causes for the low motivation to use hearing protection. We explored the usage rate of custom-molded musician's earplugs (ER-15) among 15 symphony orchestra musicians with a questionnaire, and measured the attenuation properties of their earplugs with a Real-Ear Attenuation at Threshold (REAT) procedure in a sound field. Earplug use was found to be low, and the musicians reported that earplugs hampered listening to their own and their colleagues' playing; earplugs affected either timbre or dynamics, or both. Additionally, several reasons related to discomfort of use were itemized, but the musicians who consistently used their earplugs did so in spite of problems with use. The REAT values obtained in sound field were relatively close to the manufacturer's nominal specifications, being 13.7 dB, on average. In the frequency range studied (0.125-8 kHz), individual variation in REAT was, however, up to 15 dB across the measured frequencies. Fluctuation in attenuation might be related to low use of hearing protectors, and REAT measured at fixed center frequencies may be too robust a method to uncover it. We therefore tested 10 additional subjects to find out whether a sweeping signal used in Bιkιsy audiometry would bring more detailed information on earplug attenuation. Mean attenuation was found to be somewhat closer to the nominal attenuation of the ER-9 and ER-15 earplugs up to about 1 kHz, whereas REAT measurements in sound field revealed more even attenuation at frequencies between 1 and 6 kHz. No significant association was found between earplug attenuation properties and earplug use. It was concluded that support and determination to get accustomed to hearing protector use are important factors in hearing conservation. A qualitative workplace trial was undertaken to examine the performance of sound restoration, level-dependent electronic hearing protectors (HPs) in a high impulsive noise environment using participants who were very experienced in the regular use of passive HPs. The results indicate that this type of HP is well accepted by experienced users, particularly so, by those who appreciate reliable communication while wearing the devices.